Spring cleaning is also a great gateway for soon-to-be empty nesters who want to repurpose rooms. And, it’s quite common to discover there’s a lot more than what’s expected. Through the course of a year, it’s easy to pile up possessions of all shapes and sizes. It’s a very common but strange phenomenon and just about every household does it. Before you know it, a closet is stuffed with this and that. The cabinets can’t hold one more item. And, the garage is a maze of junk. Start in the garage, attic, or basement. The best places to start are where most stuff is stored. This is because you’ll really accomplish your goal if you have more available storage space. 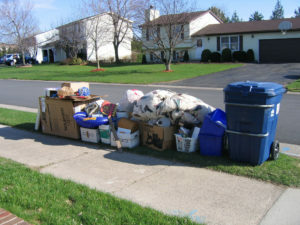 These areas are typically where the most junk is found and therefore, prime candidates for spring cleaning. Go methodically room by room. One big mistake too many people make is to jump from one room to another sporadically, trying to chip away here and there. All that does is create confusion and it’s not efficient. Instead, go room by room, one at a time and you’ll get more done. Make repairs after cleaning up. Once you’ve cleared out all the clutter and have every room clean, create a to-do list of repairs and replacements. As you make repairs, check them off your list so nothing is missed along the way. When you’re ready to jump into spring cleaning, be sure to phone 800-433-1094 or visit Junk Garbage Removal. We’ll come out and haul junk away for you so you don’t have to deal with it.